Steve Nash is one of the greatest point guards of all-time and was arguably the best overall PG during the 2000s. While Steve Nash card values do not approach the superstar level, his Hall of Fame induction should be the catalyst for higher values going forward. 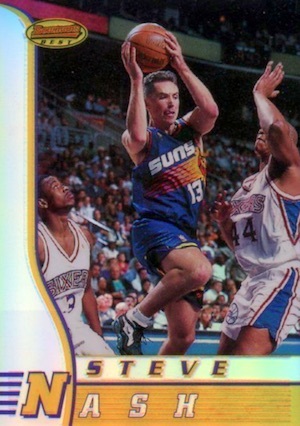 Starting with his earliest cards in 1996, collectors have quite a few options for Steve Nash. The following list looks at some of the top choices from his hobby career. Collectors likely know that his rookie cards coincide with RC releases for Allen Iverson, Kobe Bryant and Ray Allen, making for a star-studded rookie assortment in the 1996-97 sets. For more information about his first-year cards, view a complete Steve Nash rookie card checklist in our detailed player profile. 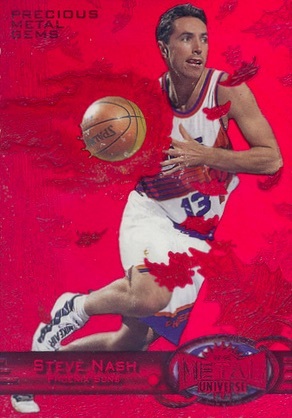 View the most popular Steve Nash card listings on eBay. Shop cards on eBay using the linked card listings below. Bolded sets go to detailed profiles. Distinct and shiny have long typified the brand's design and the 1996-97 Finest rookie card for Steve Nash is certainly no exception. In addition to the Apprentices version, there is another Nash card in the Heirs subset. Both cards also feature the popular Refractor parallels. 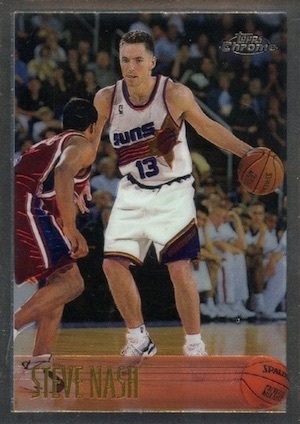 The subtle chromium cousin to Finest, 1996-97 Topps Chrome is the preferred rookie card for Steve Nash. While the base cards carry strong values by themselves, the Refractors push much higher. 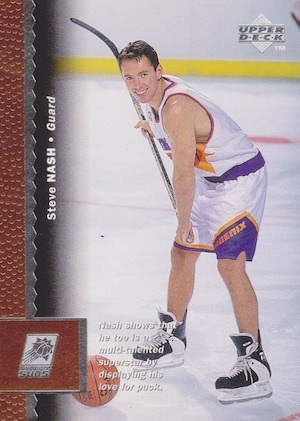 Rounding out the reflective triumvirate, the 1996-97 Bowman's Best Steve Nash rookie card features chromium technology and a bolder design than Chome. This rookie card showcases one of the more exciting images of Nash and collectors can even catch a glimpse of Allen Iverson on the left. Refractor parallels, like the one shown below, and the very limited Atomic Refractor versions produce the highest values. From a value perspective, this is nothing more than a budget rookie card. 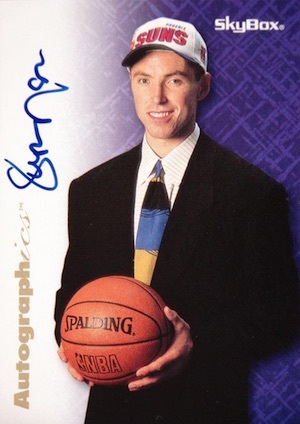 However, the image alone makes it a very cool card for a Steve Nash collector and the fact that it is also an official rookie makes it even more appealing. Fusing his Canadian and hockey background with his NBA future, this is a unique sight for a basketball card. 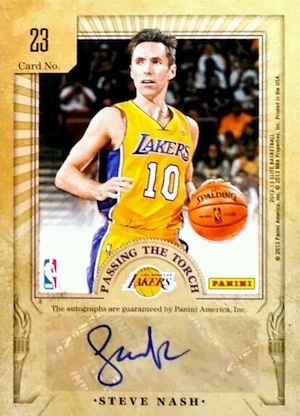 All of Steve Nash's rookie cards are base offerings, but that does not mean collectors don't have first-year autograph options. In fact, the '96-97 Autographics card remains one of the top Steve Nash autographs to this day. While most are signed in black, the rare blue ink card is reportedly limited to only 100 copies. 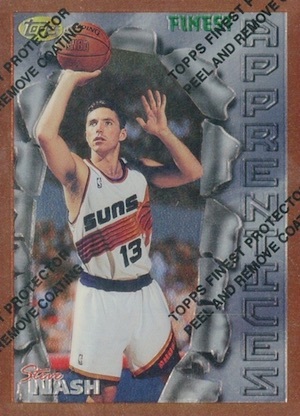 Released during Steve Nash's sophomore season, 1997-98 Metal Universe is the place to find one of the definitive 1990s parallels: Precious Metal Gems. The PMG print run is 100 copies, but only the first ten feature green foil and the remainder use red foil. An updated PMG version for Nash came in the collegiate 2011-12 Fleer Retro. 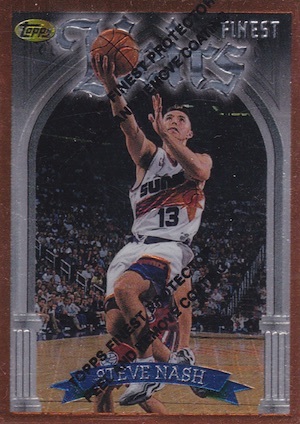 Covering Steve Nash's second tenure with the Phoenix Suns, Exquisite Collection was the highest of high-end and offers some of the most popular basketball cards of the decade. 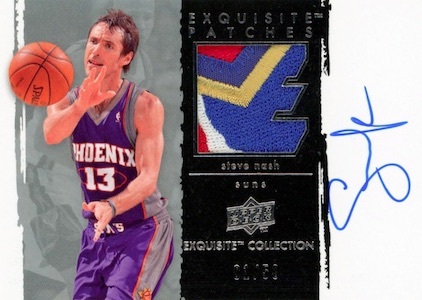 While he was not included in the super-premium line once Upper Deck lost the NBA license, the existing Exquisite Steve Nash autographs still see considerable interest. It will not come as a shock to say that his time with the Lakers was hardly a success, but the Steve Nash cards from this period are still a top option for collectors. 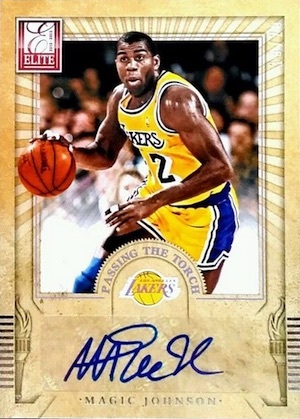 The Passing the Torch insert pairs Nash with the greatest point guard in the Los Angeles Lakers' history, Magic Johnson. The only downside is the sticker autograph, but a print run of just 25 keeps values strong whenever they surface. 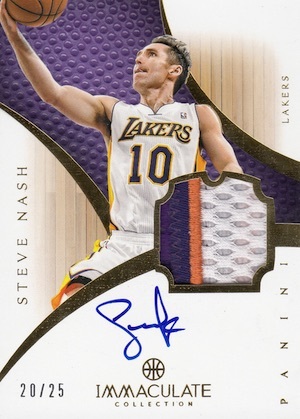 Mainly showcasing Steve Nash as a member of the Lakers, modern options from super-premium brands like Flawless, Immaculate and National Treasures are some of the most valuable cards available for Nash. Most of these limited autographs feature on-card signatures and patch pieces, in addition to some impressive designs.